Glencairn Pat.No.392 from the early 1960's !!! It was really exciting to find this pattern in Alison Reid's little Aunty Mavis shop yesterday in St Kevin's Arcade, K Road! 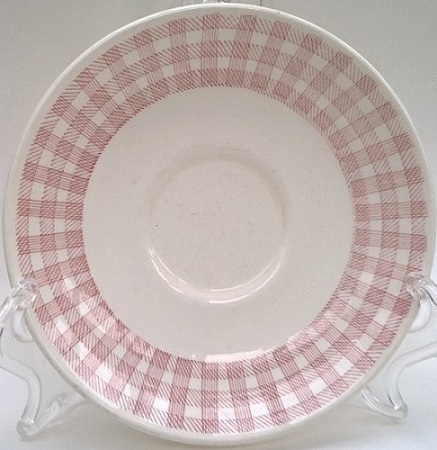 I had seen this pattern in Crown Lynn adverts that are at the Auckland Museum, but as they are in black and white from the early 60's, I had no idea what colour it would be ...... and it's PINK with a Scottish tartan look !! The pattern numbers on the backstamp are rather difficult to read, but thanks to the Database I found it reads Pat.No.392. Re: Glencairn Pat.No.392 from the early 1960's !!! Thats very nice! 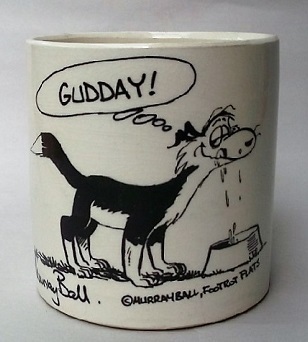 I wonder if they are tartan Tulip cups or sth Pacific.?? and I went looking and found this ... photo deleted . 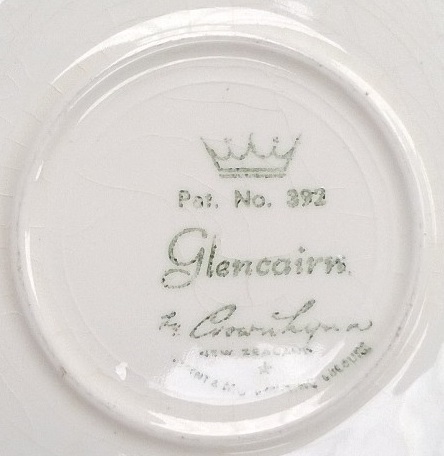 Glencairn d392 - Underglaze light red border stamp; light red colour glaze 781 cup.